Although the added beauty of planters can significantly improve the aesthetics and general ambiance of any dwelling or work place, the potential damage they can cause if not properly waterproofed, especially those over living areas, is horrendous. Planter leaks are often responsible for the delamination of surrounding deck coatings, dry-rot, as well as damage to any below or adjacent interior finish work. A properly prepared waterproofed planter insures your building or home's surrounding stucture remains free of water damage, including severe dry rot (or other damage) that can develop over time in this type of a consistenly wet structure. This is a planter that has been sloped and waterproofed over a parking garage in Lancaster, California. Choose SCD for your next planter waterproofing scenario in order to prevent incurring cost for the repairs of the aforementioned potential damages as well as costly landscaping charges. 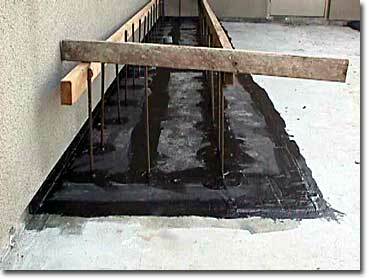 Our experienced installers will put forth all of their knowledge and experience to ensure waterproof integrity. This is the (Grace Bituthane 4000) waterproof membrane installed below the planter area prior to its installation to ensure waterproof integrity. 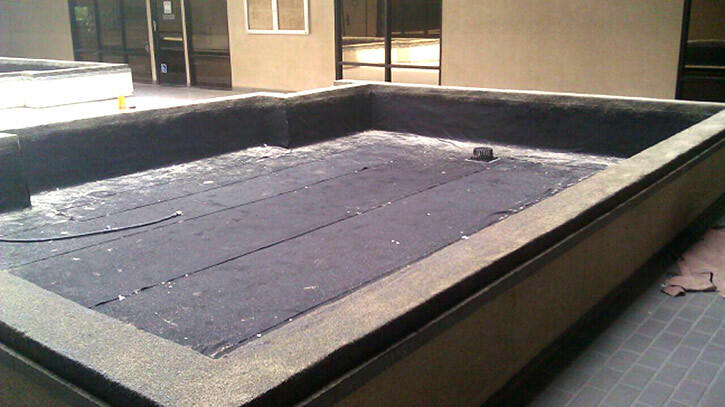 This planter waterproofing project was done in Pacific Palasades, California.